Works in demo mode until registered. Works as full version with serial number. 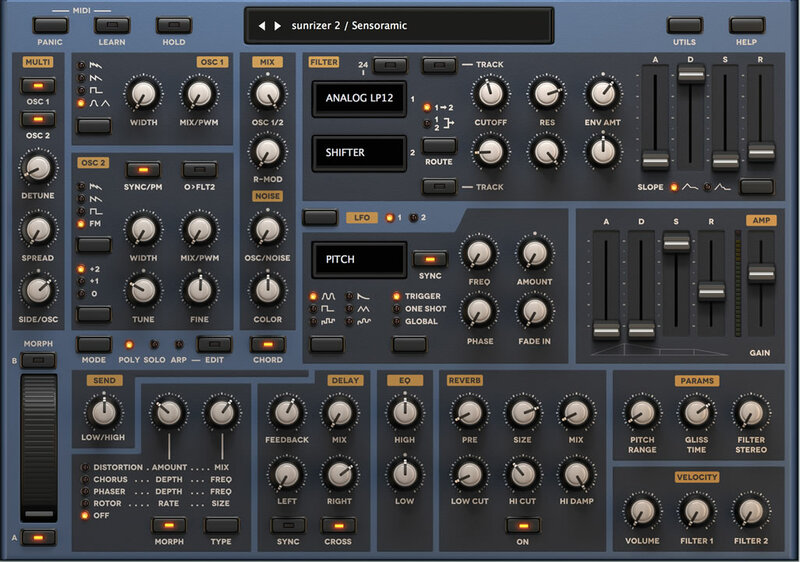 Sunrizer is built upon a familiar subtractive synth design – but with a distinct character and a host of unique features. It starts with two oscillators and two sub-oscillators that deliver all of the basic waveforms and a perfect emulation of JP-8000 “supersaw”, with pulse width, frequency and ring modulation plus a lush unison mode. The oscillators are fed into two powerful filters with serial or parallel routing, offering traditional low-, high- and band-pass modes as well as comb, resonator, waveshaper, and frequency shifter algorithms – and more. To set all this in motion, Sunrizer has two ADSR envelopes and two LFO generators that can modulate virtually any parameter. Sunrizer has a very flexible effects section which boasts an input crossover filter that lets you apply them only on a specific part of the spectrum. There is a total of four effect modules – the first includes silky-smooth chorus, phaser and rotor algorithms alongside distortion, followed by stereo delay, two-band equalizer and a spacious and highly tuneable reverb. Yet with all this power Sunrizer still keeps the processor load low, thanks to heavy code optimizations. Where the Sunrizer’s sound engine ends, the fun only starts. First off, each patch has two sets of parameters and the synth lets you morph between them – as smoothly or as wildly as you wish. Sunrizer also sports an arpeggiator that has fully programmable sequences and supports per-note transposition and randomization – together with chord memory it allows you to create elaborate yet finely controllable single- or multi-finger passages. Despite such an extensive feature list, Sunrizer has a single-screen design with finely crafted graphics that especially look gorgeous on Retina screens. All of its building blocks are logically arranged and easily accessible, with each individual parameter carefully calibrated. This lets Sunrizer give you a mix of utter pleasure and great productivity that is lacking in most unnecessarily overcomplicated synths. Bespoke synth engine with 24 voice polyphony and very low processor load. Two oscillators with multiple waveform types, hard-sync, pulse width modulation. Oscillator mixer with ring modulator and separate noise source. Per-oscillator unison function with variable detune and spread. Two separate filter units with serial or parallel operation and 16 different algorithms each: low-, high- and band-pass, notch, comb, formant I/II, all-pass, power low- and band-pass, waveshaper, resonator, resampler, low-pass + resampler, frequency shifter, analog low-pass. waveforms; variable phase, fade-in time and different trigger modes. Master effects including chorus, phaser, rotor, EQ, delay and reverb. Arpeggiator with deep sequencing capabilities. A-B parameter morph feature: essentially two synth patches in one. Factory sound bank with over 400 preset patches; full patch compatibility with the iPad version. There are some problems with current version and Cubase DAW. We are working on this.